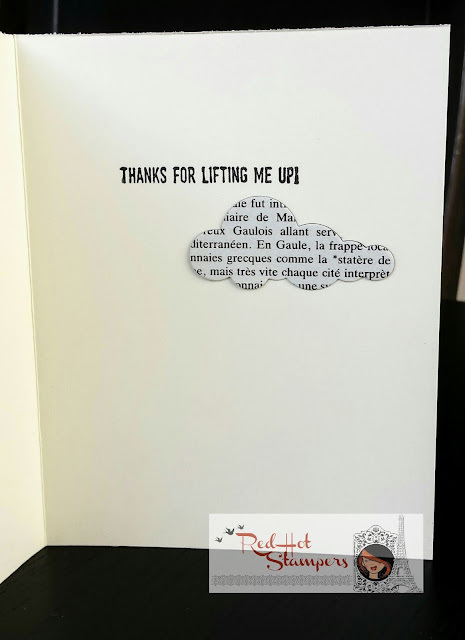 Red Hot Stampers: Just a Note to Lift Me Up! Here is another card using the Lift Me Up bundle. This one might be my favorite. Classic black and white (actually vanilla), hot air balloons, french script, simple yet stunning! This is my style FOR SURE! A couple tricks with this card. It's surprisingly well thought out for such a simple looking card. Adhere the well-loved book page to a basic black scrap. (Or if you have any remaining pieces of that gorgeous Typeset DSP left, use that! Stop hoarding it. It's time to let go.) The size here depends on your book page (or leftover DSP). I just trimmed off the margins and cut the basic black cardstock to just about 1/4 inch larger all the way around. My black scrap ended up being 5" by 3-3/4". Cut the cloud out of both layers and save it for the inside of the card. Lay the book page/cardstock layer (DON'T adhere it yet!) 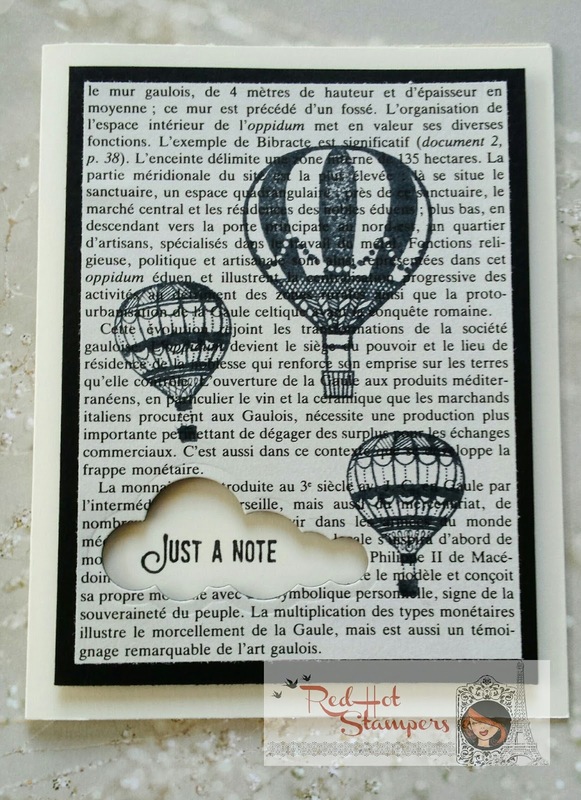 on your Very Vanilla card base and stamp "Just a note" through the cloud. I used a Basic Black Stampin' Write Marker to color just part of my sentiment stamp. I do that a lot. Love those markers. THEN adhere the stamped and layered cardstock onto your card base using dimensionals, making sure the stamped sentiment shows through the cloud. The dimensionals give that reverse die-cut cloud more depth and shadow to draw your attention down to the sentiment. Use your adhesive of choice to stick that pretty little cloud onto the inside of the card, and offset the inside sentiment just a touch to the left. Et voilà! I hope you like it!